Indoor and outdoor soccer facility with climbing wall, four indoor fields and two outdoor fields and martial arts center. Information and on-line registration for NIKE Sports Camps. Offering instructional programs in 15 sports at more than 500 locations across the United States. Information and online registration for NIKE Sports Camps. Offers instructional programs in various sports at listed locations across the United States. Matches youngsters and adults to all types of individual sports trainers and sports camps throughout the USA. Christian sports camps for boys and girls. Features locations, schedules, activities, staff, and forms. Nike Water Polo Camps designed for 10-18 year olds to develop their athletic skills. Camps are located in southern California, USA. Tennis, soccer, lacrosse, and computer and sports camps held at SUNY Purchase College, Pine Hills Country Club in Manorville NY, and 2 sleep-away tennis camps in Italy and Ascutney Resort, VT. US Sports operates the camps at colleges and high schools throughout the country. Online registration is available. South Tampa sports facility is home to cheerleading, dance, gymnastics, tae kwon do, wrestling, weight training, after school camps, and summer camps. Offers volleyball and basketball camps for boys and girls, 8th grade and up, in Texas and Oklahoma. Includes online registration, schedule, and information about daily programs. Youth football camps for ages 8 - 18, each led by a current or former NFL player. Guest appearances by other players who actually teach while at the camp. Information and contacts for each sports camp sponsored through the university. A searchable directory of sports camps in the US. - overseas winter sport training camps. Browse or search for summer camps including day camps, overnight camps, and travel camps for boys and girls. Job opportunities also available. Provides a variety of sports day camps, holiday camps, and adventure programs for kids ages 3-15. Based in Thornhill. Program details, bussing information, dates, rates, and registration form. Summer sports day camps located in Northfield and Chicago for children ages 6 to 13. PDF brochures plus program philosophy, transportation, lunch, and facilities. Division of North American Sports Camps provides soccer products, programs and services. Includes a history of the company, employment opportunities and a camp store. Located in Mystic, Connecticut, United States. Traditional boys and girls camps located in Equinunk, Pennsylvania providing water and land sports, a hobby center, and nature and outdoor recreation. Offers photos of bunks and events, basic information, and camp song lyrics. International baseball, softball, basketball and golf sports camps in the Dominican Republic. A directory of field hockey camps located in the United States. If the business hours of The Habitat for Soccer and Sports, Inc in may vary on holidays like Valentine’s Day, Washington’s Birthday, St. Patrick’s Day, Easter, Easter eve and Mother’s day. We display standard opening hours and price ranges in our profile site. We recommend to check out thehab.com/ for further information. 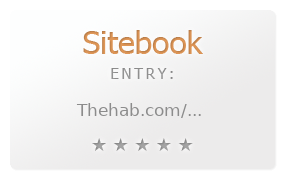 You can also search for Alternatives for thehab.com/ on our Review Site Sitebook.org All trademarks are the property of their respective owners. If we should delete this entry, please send us a short E-Mail.